Touching a live turtle, smelling skunkweed, or seeing a beaver up close for the first time is a personal, memorable, and educational experience. At Ellanor C. Lawrence Park (ECLP) in Chantilly, Va., we have three live birds of prey that we use for programming, and standing a few feet from a raptor that most people only see circling in the sky or hear on a faraway tree branch can be an eye-popping experience. We want people to have these meaningful and memorable experiences, and housing exhibit animals is one way to do that. Caring for a raptor is a little more complicated than providing a home for a parakeet. There are challenges, and chief among them is meeting the federal and commonwealth legal requirements for their care and use. We can’t just catch an animal and put it on display. By law, wildlife belongs to Virginia, and we must have permits from the commonwealth in order to care for and display animals. Jim Dewing, ECLP’s Resource Manager and Interpretive Naturalist, has the personal permits and permissions that are required to hold, house, and display these unique animals. Our use of the birds for interpretation requires care and a range of humane needs, and those needs may include issues related to an injury that may prevent a rehabilitated animal from being released back into its wild habitat. We have to consider the safety of the birds, the public, and the staff. These are, after all, predators. There are ethical concerns in keeping and confining live animals for interpretive purposes, and we address those with established policies and industry standards that guide how, when, and in what way we use the animals. Once again, there are state and county regulations governing these issues, and each of our staffed sites has procedures in place that can go beyond these requirements. In addition, our care of domestic animals, such as the cows, pigs and chickens at Frying Pan Farm Park, follow county Animal Control Services guidelines. As tools for first aid and safe handling training of animals by Animal Control personnel. In addition to the priorities of care and interpretation, we create a business model to ensure the animals help us earn enough revenue to pay for their care so that they are of value to each park’s overall mission and objectives. Before assuming responsibility for an animal, a park has to ensure hosting the animal meets the site’s objectives effectively, efficiently, and ethically. One of those objectives is interpretation – personal, memorable, educational experiences that bring us closer to natural resources, makes us more comfortable outdoors, and helps everyone to become better stewards of the natural resources that keep us healthy and the cultural resources that help reveal who we are. Author John Shafer is a Naturalist and the Manager of Ellanor C. Lawrence Park in Chantilly. 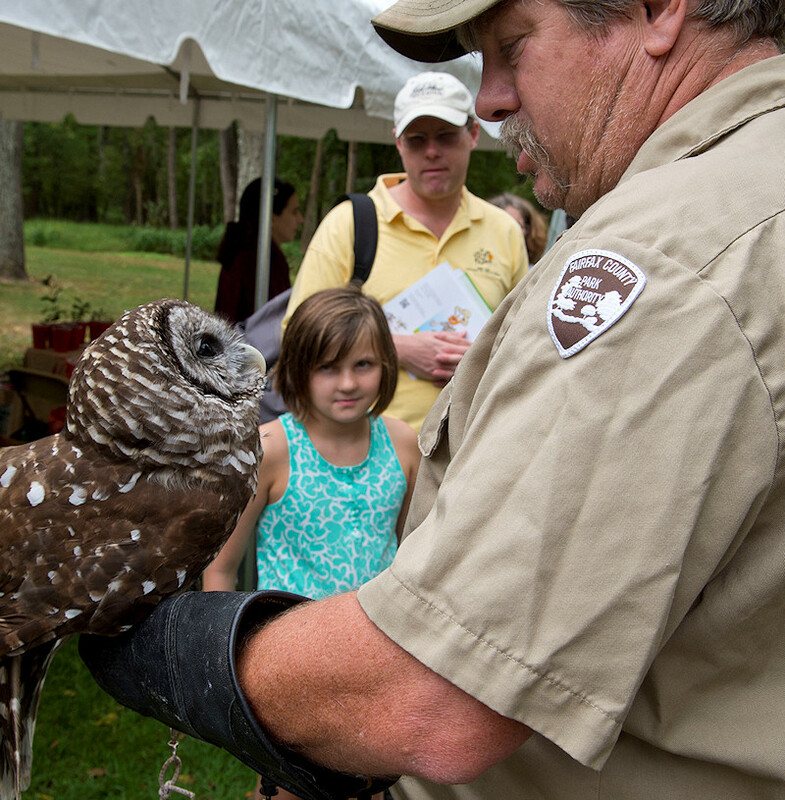 Call ECLP at 703-631-0013 for information about programs that include raptor interpretation. A version of this story was published in the NAI Region 2 publication Chesapeake Chat. This entry was posted in Uncategorized on October 28, 2015 by Fairfax County Park Authority.